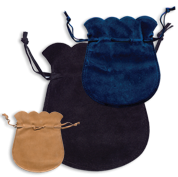 Find elegant Eurosuede Drawstring Pouches for your jewelry collections and make a strong impression on your customers! Shop high-quality pieces made of a soft material, available in various colors, ranging from beige, black or even red. Perfect for packaging rings, earrings, pendants, necklaces chains & other items.